Living in Maine for almost half a century, Stan Leiberman picked up his first paint brush in 2007 at age 62 and has been on the fast track ever since. Working primarily in oils, Stan is drawn to the beauty of Maine and concentrates on painting the places and things around him employing robust color in the realist style. In 2007 Stan joined with his long time mentor, R.N. Cohen, in the opening of Congress Square Gallery in the heart of Portlands downtown arts district. In the Gallery, new original works as well as giclée prints are continuously being offered by both artists. 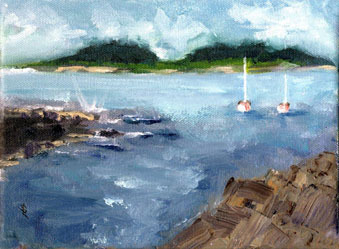 In addition, Stan makes available a fine selection of note cards printed with the image of his paintings. Stan hopes to paint for many years to come for his own pleasure and for that of the viewer. We'd love to hear from you.